So we just got back from two weeks at the lake and it feels like summer is finally underway and we’re kicking back, reading, chilling, in our groove…and all the stores have the hangy cardboard pencil decoration-thingys up and the back to school sales already. I’m so not ready for this. On the plus side, the sales on back to school supplies make them crazy cheap right now. I always stock up because, inevitably, I end up having to buy a box of crayons sometime around March for full-price and a tiny part of me dies inside. I’m not suggesting you give someone a box of crayons for their birthday (though I think I’d love that). But they make a fun, little present to add to the top. Or grab a bunch to use as favors for parties you’re throwing. Many food banks and community centers do back to school drives to outfit kids with backpacks and school supplies. Donate some supplies. As a longtime volunteer in children’s ministry, I can tell you they appreciate these things. Kids’ ministries can always use new crayons, markers, and other crafty things. And paper! Oh my goodness, lots of paper. Again, not just a box of crayons. But add them to another gift, or grab a backpack to fill with fun things or something. Keep your eyes open and be creative. To entertain kids at the doctor’s, or the DMV, or other boring places. And no judgment from me if you bust them out and color all by yourself. It never fails. ‘Round about December (cold season), every year we get notes from teachers asking for more Kleenex and sanitizing wipes. By March or so, the kids have lost or destroyed half their crayons and no one has a pencil anymore. Keep a secret stash to replace these things. We usually keep colored pencils (crayons melt!) in the car with our nature journals for summer exploring and writing. 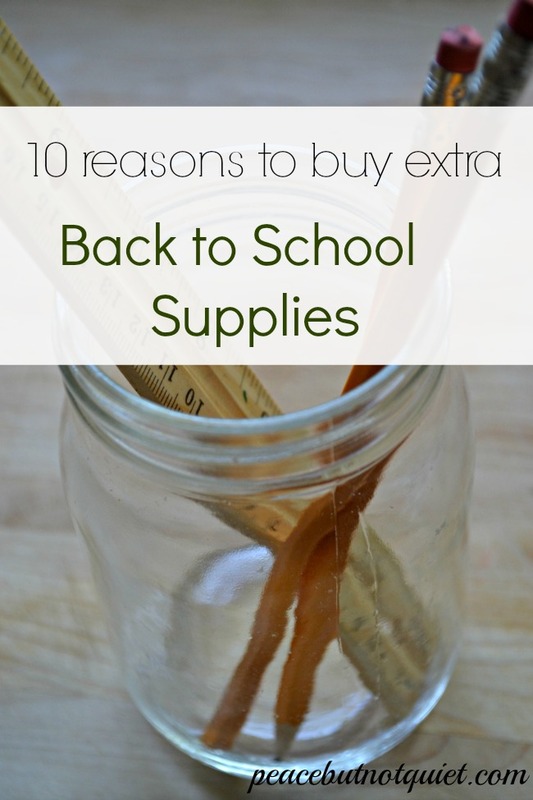 What do you use extra back to school supplies for? All great reasons! I have been thinking of Operation Christmas Child when shopping this year! Christmas stockings and Easter baskets. My kids always get colored pencils in theirs. I bought some nice ones on clearance a while back for this Christmas but I will be sticking up on the school sale ones for OCC boxes. Oh, I love that idea! I’m totally going to grab some for stockings and baskets…thank you! OMGosh I had to laugh at “…and a tiny part of me dies inside.”. I would have never worded it like that but that’s about how I feel when something like that happens. Too funny. Thanks! It never fails — every March I need something like that and I wish I’d bought more when they were dirt cheap!